Photo: Students from our girls home are happy to pose in a celebratory coconut harvest photo before heading to school. Our new coconut grove has matured, now with 145 trees yielding coconut harvests 3 times annually — we reap a harvest of 1,400 coconuts per year. The younger coconuts are used in the children’s diets — after the nuts are opened, the soft sweet meat is delicious to eat, and the juice is refreshing. Coconut milk, made from the meat of coconuts, is full of every good thing the body needs to survive including vitamins C and E, many B vitamins, and magnesium, potassium, phosphorous, and iron. The children often enjoy buko — the local name for the young coconut meat — in salads prepared by our native staff. Inside the older coconuts, the meat is thick and hard and is called copra. We dry this meat and sell it to the local market for profit as it can be processed into coconut oil, soap, cosmetics, and fuel for vehicles. Our grove of coconut trees produces a very versatile and profitable fruit, a blessing to our children and native staff. 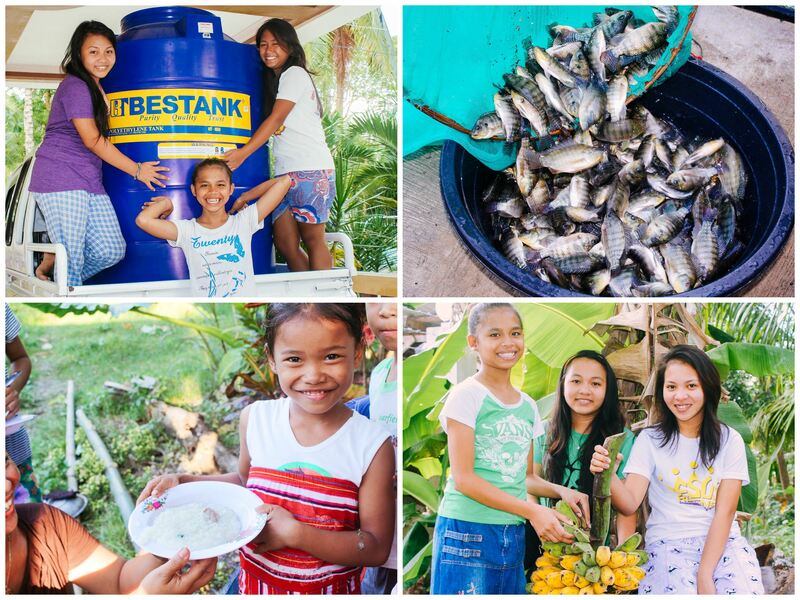 In other good news, we recently received a new water tank at our fishery on the island of Cebu. The new tank has increased our water flow which supplies the fishery, producing healthy fish, and it also provides clean baths for the children, aiding their hygiene and health. Water for the fishery is continually aerated and supplied with fresh water from a pure aquifer using our own well, reducing the chances of fish contamination to almost nil. During April or the month of May, we expect to yield around 1,800 fish at harvest time which will be sold for profit, and will add a delicious and nutritious staple to the diets of our orphans and others in our children’s outreaches on the island. The profits from our fishery as well as our on-campus vegetable gardens, a hen house that produces over 24 dozen eggs a day, and a banana grove that yields over 6,000 bananas a year are enabling us to extend our programs to the children. All of these agricultural projects are located on our existing campus on Cebu, where our aid to the community includes scholarships and nutritional support for orphans recovering from child labor or abusive situations, and a weekly outreach to children in various locations around the island. These weekly outreaches usually take place on a Saturday, and average about 100 children in attendance. The program is styled after a VBS day camp feel, but also includes dental hygiene training and distribution of toothbrushes and toothpaste — on the island, 3 out of 4 children suffer from tooth decay by the age of 6.